Researchers have proven that chimpanzees are self-aware and can anticipate the impact of their actions on the environment around them, an ability once thought to be uniquely human. Chimpanzees are black, but older individuals may have a grey back. Both genders often have short white beards. The ears are prominent. Infants have a white tail tuft and pink to brown facial skin, which darkens by adulthood. 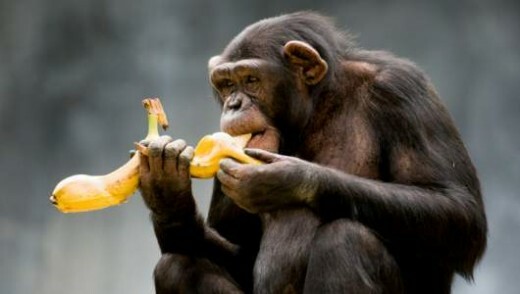 Chimpanzees have been shown to have their own individual personalities. Chimpanzees behave in a way indicationg that they feel empathy. Chimpanzees live in fluid social groups consisting of a core of multiple females and dominant related males, whom are highly territorial and will routinely patrol their home boundaries. Females tend to live a more solitary life than the males, often choosing to spend much of their time alone with their offspring. Chimpanzee infants are completely dependent on their mothers until about five years of age. When males are between the ages of 8-12 years, or adolescence, they will increase their independence and spend more time in the company of adult males. Females tend to remain close to their mothers during adolescence, becoming mature at age 11 but only beginning to breed at age 13-14. On average females will have about three offspring during their lifetime. Chimpanzees travel mostly on the ground but will mostly feed in trees during the day and make a new nest every night in the forest canopy to sleep. Chimpanzees are classified as endangered in the wild. Aside from habitat loss they are hunted for bushmeat and infants taken for sale into the pet trade. Chimpanzees have many different vocalizations from soft grunts and lip smacks to alarm barks and screams. One of the most notable vocalizations is the pant hoot used in situations of increasing social excitement. Chimpanzees are also capable of learning basic human sign language. Chimpanzees have opposable thumbs and toes that allow for grasping, climbing, and object manipulation. Chimpanzees are very dexterous and are able to manipulate objects in their environment in order to fashion and use tools. These tools are usually used to obtain food sources. Sticks are used for termite fishing and ant dipping, leaf sponges to soak up water and, in West Africa, chimpanzees use specially chosen rocks to crack hard palm nuts, a behaviour that can take many years to perfect. Baby female chimps were recently discovered playing with sticks like human children play with dolls. Their diet varies seasonally consisting mainly of fruit (~50-75%), but also leaves (~12-45%), flowers (~1-18%), seeds (~1-11%) and animal prey (~1-5%) such as grubs, termites, ants, wasps, birds and mammals including bush-pigs, duikers, rodents and even other primates. In the Ivory Coast chimpanzees will hunt together cooperatively to catch red colobus monkeys, the meat is much prized and its subsequent sharing strengthens male alliances and familial bonds. We, Homo sapiens, share 98.4% of our DNA with chimpanzees. In response to our greater understanding of our close similarity to great apes in terms of their capacity for self recognition and their innate intelligence, a movement called The Great Ape Project, calls for certain civil rights to be granted to all great apes, including the right to life, liberty and freedom from torture. Despite our increasing understanding of the significant similarity between humans and chimpanzees, humans continue to use chimpanzees in experiments, including experiments which cause them significant pain and suffering.